Should Tesla Go After China on Its Own? Should Tesla use a joint venture partner for China? While it would cut into the reward, it would also reduce the risk. On Monday, investors and industry observers woke up to the speculation that Tesla Inc (TSLA - Get Report) may get moving in China sooner than expected after the automaker registered a new subsidiary in Shanghai. During the company's quarterly conference call earlier this month, management told investors that a location for its Gigafactory in China would be decided on shortly. Aside from the Gigafactory, many investors are anticipating Tesla building a production plant in China for its automobiles as well. These comments also came shortly after China said it would relax its policies on factory ownership there. In previous years, automakers like Ford Motor Co (F - Get Report) and General Motors Co (GM - Get Report) had to form joint venture (JV) partnerships with local manufacturers to build auto plants in the country. The laws did not allow for GM, Ford and others to own more than 50% of these factories, with the other half behind owned by the JVs. Given how large the Chinese economy is though, the automakers felt it was a worthwhile sacrifice. Now that China is lifting those requirements, some investors felt that GM and others would buyout their JV partners to control 100% of the venture. But that's not in GM's plans, with the automaker saying it would not look to buy out its JV partners, and that its growth in China is because it's working with trusted partners. Further, the automaker "will continue to work with our partners to provide high-quality products and services to consumers." The good news for Tesla? It can own 100% of its venture in China. But as much opportunity as that presents, it also presents financial and execution risk. 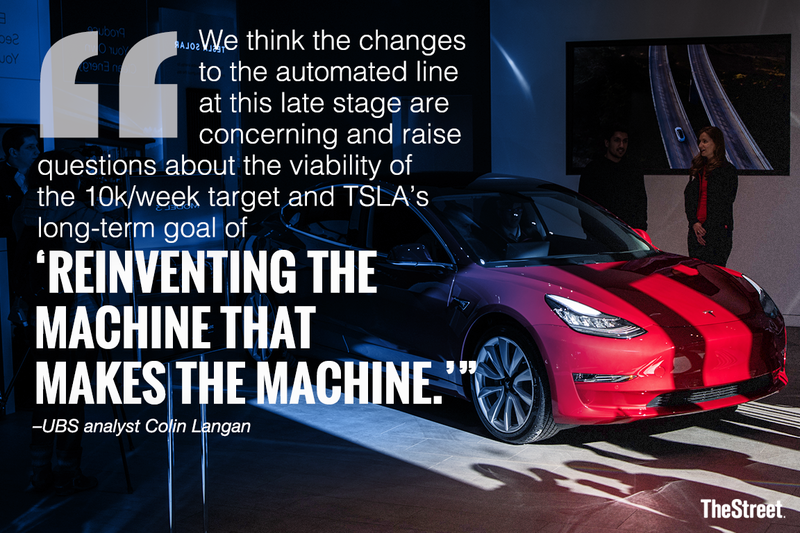 The automaker has already shown how vulnerable it is from a manufacturing perspective as the Model 3 turned into "production hell." And that's coming from its Fremont factory in the U.S. where it already produces two other vehicles. Of course, Tesla could learn from its execution and production errors of the past when it comes to China, but management has proven time and time again to over-promise and under-deliver. Who's to say they won't again? Worth mentioning is that going at it alone in the U.S. is what caused so many issues with the Model 3, rather than seeking help and mopping the competition. Additionally, there's the worry about cost. Building or buying a factory, staffing it and running it isn't cheap. Just look at how much strain the company's current overhead is putting on Tesla's balance sheet. Cash fell to $2.7 billion in the quarter, down from $3.4 billion in the previous quarter. Debt swelled to $10.8 billion from $10.3 billion. With further cash bleed and gross margin pressures this quarter, the financial situation will become direr before it gets better. CEO Elon Musk still stands by his statement that Tesla will be profitable and cash flow positive in the third and fourth quarter of this year. If that's the case, Tesla's potential in China is wide open. If the automaker can fund its ambitious vehicle plans in the U.S. while simultaneously supporting its growth initiatives, the bulls have a real case to be made for buying the stock. Those are a lot of "ifs" though, and low-probability ones at that. So when looking at Tesla's opportunity in China, maybe a joint venture wouldn't be such a bad thing after all. There would be concerns on Tesla's part, certainly, such as sub-100% ownership, its technology being shared, etc. But it's either that or potentially raising capital. Because it's unlikely the Model 3 will contribute to the bottom line in the short-term the way some bulls believe and with its debt and cash levels each moving in the wrong direction, China seems like a pipe dream at the moment. That's even as electric vehicle sales continue to boom in the country. It's clear Tesla has a significant opportunity in China. The question is whether the company can get to the level of execution, profitability and financial levels required to pursue it.